Dine in an idyllic ambience overlooking the Portland coast in relaxed, unpretentious surroundings, savour the finest flavours... Discover the hidden pearl of the South West. Quality Food served by very Quality staff I’d would recommend the Crab Hose Cafe , my mother and father both in their eighties had a great time the food was out of this world they both left raving about the place . Seafood dining at its' best. Staff to match. Can thoroughly recommend. Service was a little slow but it was very busy. The food was delicious but we felt the puddings were a little pricey. Was the Raspberry and meringue roulade supposed to be frozen? It was nice but not sure whether or not it was supposed to be frozen. Came here whilst on a bank holiday weekend visit to Weymouth - the food was delicious, especially the crab & oysters. The service was great, we asked for our table to be changes so we could sit in the sun and the staff kindly accommodated us even though they were fully booked. Great wine selection too which matched the seafood, I'd love to be back here! Really relaxing lunch in lovely surroundings no pressure to make you leave even though they were very busy. 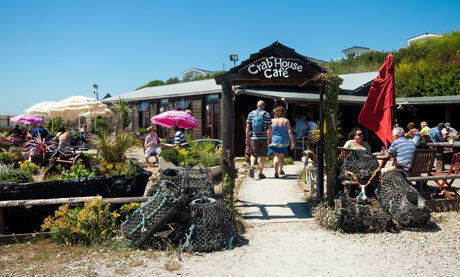 It’s worth travelling half the country to dine at the Crab House Cafe. The staff and service are spot on, and the food...well it’s pretty much out of this world. Varied and interesting menu, all of our food was cooked perfectly, amazing venue on chesil beach. Parking was a challenge! As usual, great food and boencw, friendly and attentive staff who kept our table reservation despite us being one hour late in the Good Friday Purbeck traffic! We have been here many times, never have we been disappointed. Superb restaurant !!! The most impressive thing about our Good Friday lunch experience was that having mentioned that my Brill and Tagliatelle were both way overcooked the dish was immediately taken away and replaced with a delicious Skate Wing with Chorizo. No ifs, no buts, no grumbles, no arguments; just taken away and replaced. Top marks for such good customer relations attitude. Well done. We’ll definitely be back. Superb quality,freshest fish and seafood you could possibly get. We visited the Crab House Cafe last week for lunch on a cold and blustery day - we weren't disappointed on the standard of food and service. Highly recommend a visit and loved being able to see fish being prepared. Good food - served quickly and hot. Lemon sole gentle and fresh. Scallops cooked very well. 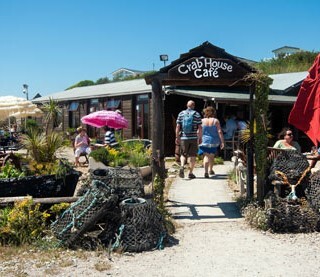 We have been coming to The Crab House for well over 10 years now - it is consistently excellent, we have never been disappointed and is our first restaurant of choice when wanting to eat out, go out with friends and family, celebrations  - any excuse really - not that sure we need an excuse at all! Amazing night ! The food was beautiful and fresh! I am not really someone who enjoys eating fish and went along for the evening because my partner wanted to go. By golly, am I glad I did! We both enjoyed some of the best fish dishes we've ever had at the Crab House Café. The experience was made even better by the attentive and polite staff. There was a great atmosphere and I would heartily recommend a visit to anyone, especially fish sceptics like me! We have been several times and the food and service is always excellent. Fabulous food, great setting, excellent, friendly, helpful service. Faultless fish!